Ever feel like your life looks great on paper, but for some reason it feels like something's missing? For the vast majority of us, the first couple years out of college are going to be hard. Finding work when you’re young is a challenge, finding a job with stability and a livable wage all the more so. Getting a roof over your head (ideally, one without holes in it), maintaining a healthy diet– it’s all going to be tough. The only thing that’s going to be tougher is knowing what you’re supposed to do once you’ve gotten all that taken care of. There’s the unshakable feeling that something is missing- though what that might be we can’t quite seem to figure out. The answer to that? Well, that might be a concept called “Self-Actualization”. Largely developed by a brilliant psychologist named Abraham Maslow in 1954, Maslow mapped out what he believed were the essentials of human existence, not just in some survival sense, but in terms of being intellectually, spiritually, and relationally fulfilled. Maslow argued that the boredom, stress, depression, and angst we so often encounter (especially at times when everything would appear to be going well) is due to a “deficiency” of one or more of these needs. To address this, Maslow created a simple system for understanding what keeps us from being all that you can be. He called it “The Hierarchy of Needs”. Food, shelter, and safety aren’t the end goals of life, they’re the start. Those of us imagining that we just need a bit more cash in the bank or a little more food in the cabinets are going to be in for a rude awakening. We need more – it’s as simple as that. But more of what? Physiological needs and safety: these aren’t just important, they’re foundational – but they’re still not everything. Once we’re warm, well-rested, and fed it dawns on us that all we’ve really covered are the basics of existence. The answer to the question “So now what?” is actually a very simple one. One of the things we’re going to find ourselves missing most about college is the circle of friends we had. Out in the great, wide world meeting new people is difficult, and if you’re living away from your family things are made all the rougher. Still, this has got to be your next step. Rebuild a network of people who care about you, appreciate you, and make you feel like a real person. Significance is one of the things that gets stripped away from us out of college – meaning something to someone (heck, even if it’s just a rival) is your way of getting that back. Friends and family aren’t just important because of how they make us feel, they’re important because of what they allow us to feel. Show me a man with confidence and I can guarantee it’s because someone first helped make him feel that way. Pride, self-respect, self-reliance – as much as we might like to think that these things come naturally to us, chances are that we had some assistance along the way. Be realistic with your standards. Take pride in your accomplishments and lessons from your failings. Reaching this highest level of functioning means having a realistic view of yourself, accepting your flaws and inabilities as being every bit as much a part of you as your strengths and talents. Love yourself for what you are, not what you aren’t. Above all else, be able to laugh at yourself. Don’t let yourself be pressured into behaving in a way contrary to who you are. Whether it’s a friend, a mob, or all of culture and tradition – do things because you think they’re right, not because someone else tells you. As much as it’s important to have a network of friends and family to support you, you’re never going to be able to have true satisfaction unless you can do things for yourself – whether that’s cheering yourself up or changing out a flat tire. Never think for a second that you’ve seen everything there is to see, experienced all there is to experience, or learned everything there is to learn. Always be open to new ideas, or better yet, always be seeking them out. Maslow referred to this specifically as “task-centering”, noting that almost every one of the people he believed to be self-actualized had devoted themselves to a cause of some kind. Nobody’s saying that you have to join the Peace Corps, but there’s got to be some principle, some vision of the future that helps give you direction. What that might be is entirely up to you to discover. 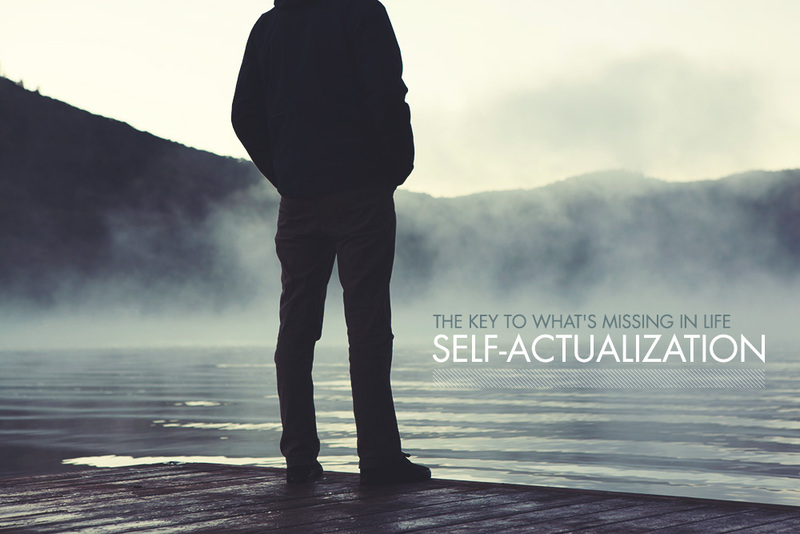 Self-actualization isn’t an end, it’s a process. As you move up through the hierarchy of being, so do the issues you’ll face. At the most basic levels we struggle against sickness, hunger, and hazards. At the love/belonging stage we have to confront loneliness, dependence, and toxic relationships. With self-esteem there exists doubt, depression, or arrogance. And then, at the final stage, we’re forced to confront the greatest questions of existence. What’s the meaning of it all? What’s best in life? What legacy do we want to leave? The greatest individuals in history have grappled with those questions and still haven’t come up with the answers. Perhaps we never will. You can call that nothing but endless struggle, but I call it nothing but endless growth. What a beautifully insightful article. Great read thanks. I’d love some additional followup articles or resources as well digging a bit further into the details. No doubt, great article Gordon. Any good books you can recommend on self-actualization? Dang, that’s a tough one. I guess it’d depend on which stage you’re at, but the ones that spring most readily to mind would probably be “How to Win Friends and Influence People”, “Scott Pilgrim Vs the World” and “Ecclesiastes”. Putting “Ecclesiastes” with a comic book and a self-help book is like recommending an astrophysics paper to someone who needs a math tutor. The Book of Ecclesiastes, while arguably useful in “self-actualization,” is about way more than the top of Maslow’s hierarchy. Indeed, great article. As per a book recommendation: Managing Oneself, by Peter Drucker. The only way we can reach self actualization is by truly knowing ourselves: our strengths, our weaknesses, what makes us UNIQUE. In this book, Drucker explains why we can only build on strengths. The more positive reinforcement we get from succeeding at what we are good at, the better we feel (ESTEEM). If other variants are in order, understanding ourselves and building on our strengths is a great way to reach the summit of that pyramid. This was awesome, Gordon. Thank you for sharing your insight. Wonderful article Gordon, thank you! Interesting, but you left out the two new ones. Cognitive needs -( knowledge, meaning, etc.) and Aesthetic needs – (appreciation and search for beauty, balance, form, etc.) . The problem with Maslow’s Theory is that it’s a theory based on a world with no internet (around 1943). After the first level of needs the others can be obtained through a loving physical environment (family, friends community) or it can be shaped by the media, social networking from people who do not have your best interest in mind. So nice theory but does it apply to today’s society or how can it be changed to fit into it? I just did a group session on this and many young people are seeking love, self esteem, approval, safety etc… through other means not the people that care about them. What do you think about that? 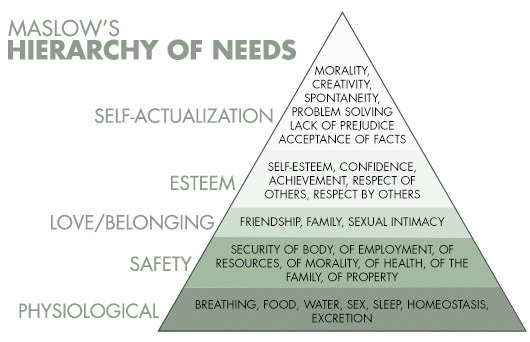 maslow is a old school guy maxneef needs charts is a more contemporary approach to the issue.